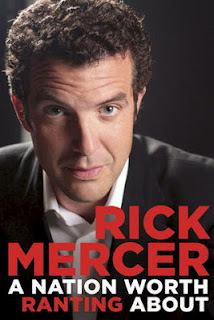 Description: An all-new collection of furiously funny rants from the most recent seasons of the Rick Mercer Report plus three brilliantly written, previously unpublished pieces by Rick. Illustrated throughout with photos and snatches of dialogue from Rick's encounters and exploits across Canada. Within these pages you'll find every rant that Rick has so brilliantly and blisteringly delivered since the publication of his previous bestseller, Rick Mercer Report: The Book. Together these rants form a chronicle of human folly, mostly featuring politicians, of course, but with honorable mentions going to people who don't know how to use escalators and Canadian drivers who don't think they need snow tires. Is Mercer getting better or are the fools among us getting worse? Whatever the inspiration-Rick Mercer's ranting has never been stronger or more on target. In addition, Rick has authored three new essays specially for this book: the hilarious behind-the-scenes story of his meeting with Rick Hansen, a hero who absolutely was not a disappointment in real life; a heartfelt reflection on public reaction to his bullying rant; and an account of his response-mystified, followed by delighted-to the news that he'd inspired a "vote mob." Illustrated throughout with photographs and dialogue from Rick's travels across Canada, A Nation Worth Ranting About will make you proud, will make you think, will make you almost as angry as Rick, and over and over again will make you laugh out loud. "I pledged then and there that someday, come hell or high water, I would be a member of that program - I too would be an astronaut. When I proudly announced my ambition to the class, Miss Barnes said, "Not with your math marks, buster," and my dream fell to earth." A greater man than I would have ignored those comments, studied hard, excelled at mathematics and science and made it into the space program, but I am not that kind of man. More likely, I spotted something shiny and became distracted." "This is what I want to know. How can a guy be smart enough to have a job that lets him drive a $59,000 car and be stupid enough to say he doesn't need snow tires when he's standing next to his Audi that's wrapped around a pole? This is Canada. There's no such thing as all-season tires, just like there's no such thing as all-season footwear." "Being a political junkie in this country is a bit like being a diehard Leafs fan. Year in and year out, they believe they will witness magnificence and magic, and year in and year out, they witness the opposite. But still they continue to show up, cheer, pay through the nose for a hot dog and leave in tears."